Hi Everyone! Happy Wednesday! I am soooo excited to say that I am now a design team member at 3 Scrappy Boys!!! I will have the pleasure of working with some amazing designers and their message board is so friendly and fun. Come on over and say hi if you have a chance!! I got to design with the April Trio kit this month. The trio kits have 3 different lines of paper and this month includes Jillibean Soup, Little Yellow Bicycle and KaiserCraft. It's a beautiful, springy kit. Lots of fun embellies, too!! Here is my first layout. I've been waiting to scrap these photos of my daughter for a while. The colors in the Jillibean Soup papers match her swimsuit wonderfully. The kit has a self-adhesive sheet of cork which worked great when I used my punches. I also made these Easter treat cups. I used a cupcake wrapper template which I downloaded HERE. I put a white cupcake liner inside to hold the treats, along with a little bit of easter grass. These seriously took me about 2 minute to make. They would look soooo cute as place settings or make a bunch for a cool table centerpiece! Thanks for letting me share my exciting news. I will have more from the April Trio kit soon. I hope you are all having a great week so far. Thanks for stopping by! Don't put your Woolies Away! Happy Monday everyone! It's a gorgeous day today and I am lovin' the weather right now. But...don't put away those woolies yet. They could come in handy for a card!! The Basic Grey woolies are one of my favorite new-ish embellishments from BG. They are felt and layered and just plain fun. I used some BG Nook and Pantry, along with the woolie which is from the Indian Summer line. Croppin' Paradise has a great collection of woolies to choose from. Go check out the Croppin' Paradise blog to see what the rest of the DT did with some fun woolies. I hope you are having nice weather wherever you are today...if not, don't forget your woolies!! Hi Everyone!! Welcome to Sweet Melissa Sunday. Unfortunately, I did not have time to bake the recipe this week. It sounded very interesting...Pavlova Peach Melba. Patty from Birding, Blossoms and Baking picked the recipe this week and I am really looking forward to seeing what everybody else did with it. I've never made a Pavlova before and the week was just too crazy to try it. Instead, i'm going to share a recipe that I discovered last Christmas in a Better Homes and Gardens Holiday Baking magazine. 2. Press into the bottom of the pan. Bake for 12 minutes. Cool on wire rack. 3. Combine 3/4 cup butter, peanut butter and vanilla. Mix well. Add powdered sugar and beat until combined. Beat in the 2 tbsp whipping cream. Stir in the chopped peanut. Spread over the cooled chocolate crust. Put the pan into the fridge. 4. For chocolate ganache: bring 1/2 cup whipping cream just to a boil over medium heat. Remove from heat. Add chocolate pieces and let stand for 5 minutes. Stir until smooth. Cool for 15 minutes. 5. Very gently, pour ganache over the bars in the pan. Spread to the edges with a spatula. Chill until set (about 1-2 hours). Life the uncut bars out of the pan using the foil. Cut into bars. I need to clean my knife between cuttings!! These were the most amazing peanut butter chocolate bars. I love peanut butter and chocolate, it's my most favorite food combination ever. I love love it and I've eaten tons of it in my short lifetime. And I would have to rate these at the top of my list. Amazing bars and so easy. Especially starting from a cake mix. What's easier than that??? Hope you are having a great weekend!! Thanks for stopping by on this Sweet Sunday! It's the most wonderful time of the year...Girl Scout cookie time!!! Which are your favorite? Thin mints? Samoas? Tagalogs? When else do you pay $4 for a box of 12 cookies?? My absolutely favorite is thin mints. Yum, yum, yum. And I overdid it this year and bought 7 boxes. Did I need 7 boxes...probably not!! So while I was looking at my extra boxes the other day I was thinking...what can I do with these??? I made thin mint cupcakes, of course!! And how FUN is that plate? I just got it at Home Goods and I love the shape. I used The Pioneer Woman's chocolate cake recipe for the cupcakes. Yes, it's the best ever. 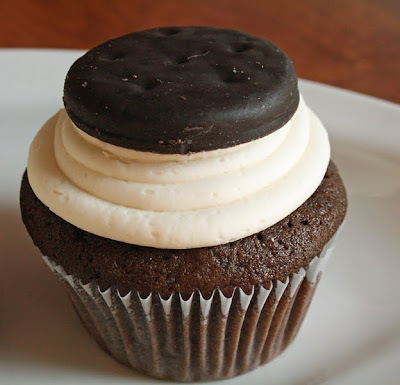 For the thin mint cupcakes, I crushed up a roll of thin mints and added it to the batter. I also made vanilla buttercream with a tsp of peppermint extract. 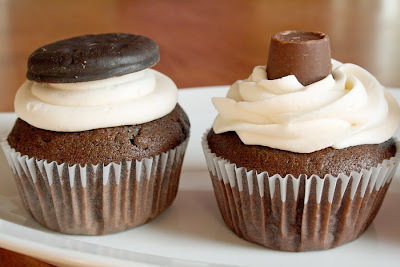 For the Rolo cupcakes, I dropped 3 unwrapped Rolos into each cupcake tin before baking. 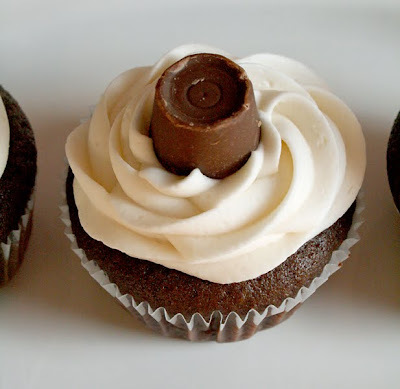 The frosting is vanilla buttercream with a Rolo on top for extra cuteness. Each cupcake had a Rolo surprise inside when you bit into it. Look at these cuties. 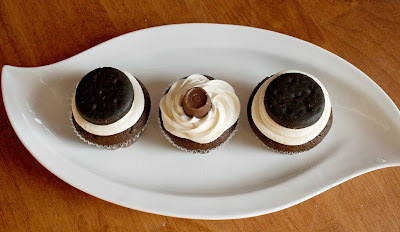 Side by side...some of my most favorite things...chocolate, vanilla buttercream, mint, caramel. It's enough to bring a tear to my eye! I brought the majority of these to work and won Employee of the Week! WooHoo!! They were both delicious, it would be hard to pick a favorite. But the next time your extra boxes of girl scout cookies are staring at you...put them in a cupcake! Okay...she turned 5 about a year and a half ago...but I finally finished her Year 5 layout. I like to make a layout each year for my kids. Sometimes they have likes, dislikes, what music they are listening to at that time, favorite books, etc. This time I had Kayla write a little note herself. I made this using the February kit from 3 Scrappy Boys. 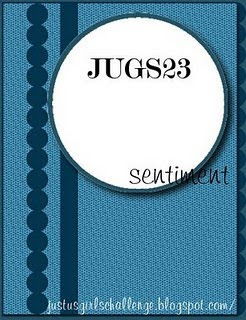 I was lucky enough to be a guest designer and had the chance to play with this lovely Fancy Pants paper!! Yes, my favorite butterfly cut from my Indie Art cricut cartridge is baaaack!!! How I **heart** those butterflies!! The little Maya Road envie holds the notes Kayla wrote. It says what she likes to do, what she wants to be when she grows up, etc. I love that she will be able to go back and look at that note later on. How fun to look at your old handwriting!! I also had fun playing with some newish Lily Bee papers, also in the 3 Scrappy Boys February Trio kit. I looove that my sister will take these silly photos with me!! Whew...that was alot to post! Thanks for making it through all those photos. I was home with sick kids yesterday and today it was back to work for the week. We have a busy weekend planned. One super fun thing is I get to meet up with Beth and her family!! They are going to be in the area and we are going to meet for dinner and drinks. I've met her only one other time and I can't wait!!! Hi everyone!!! I have another delicious recipe that I tried with the SMS group...Double Crusted Caramel Apple Pie. YUM!! Susan, from Baking With Susan picked the recipe and I was soooo excited to try. I love apple pie and haven't made one in a long time. I was excited to try a different crust recipe and the cookbook had some great advice about keeping all your pie crust ingredients cold before making the crust. And I think the crust is the best part about this pie! The crust was amazing. It called for an egg/heavy cream wash and sprinkling with sugar before baking and I think it made for a super brown wonderful crust. I had a whole host of problems with the caramel. I could not get it to work. I think I have a few more grey hairs because of it. It got to the point on the stove where the whole concoction just seized up and became this big mass of sugar. I thought maybe I had the stove on too hot, so I tried it again. Same result!! I couldn't figure it out...so I left it out. It was either that or throw the pot through the kitchen window. Ha ha...sort of. Because I was leaving out the caramel, I added some more sugar to the apples. Maybe 2 tablespoons extra?? And it turned out pretty good. What I realized when I cut the pie was the recipe did not ask for cinnamon. Maybe that's because of the caramel that is supposed to be inside? But I think it needs cinnamon. 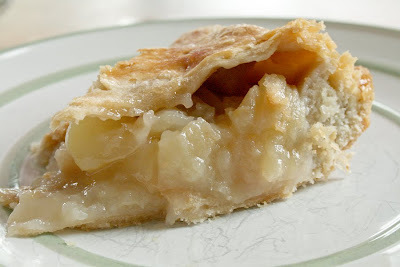 I love the classic combo of apples and cinnamon and I missed it with this pie. Does anybody else always misspell cinnamon? I always spell it wrong...2 n's? 2 m's? Thank goodness for spell check!! Go check out what all the other SMS bakers did with their pies this week! I really liked this one. I loved the crust and I think with the addition of cinnamon, the inside could be fabulous. Maybe i'll try caramel again...not to sure about it. Anybody have any suggestions? Or other caramel recipes?? Thanks for stopping by! Have a sweet Sunday! I had the pleasure of working with the Lucky Me papers from Little Yellow Bicycle this month from Croppin' Paradise. I just loved the blues and greens and yellows in this paper. It went beautifully with some baseball photos I've had of my hubby and son. I've been hanging onto this photo for a while, just waiting for the right paper. I used kraft cardstock as the base. I played with that photo in photoshop and spot colored their hats. They were sitting in the 3rd row behind home plate at a Dodger game last summer and they were soooo excited!!! These 2 bleed Dodger Blue! I loved the canvas letters from the Lucky Me line!! Here's another one with my 2 cuties. They took a tour of Dodger stadium last summer and here they are...sitting in the Dodger dugout. Who knows...maybe Andre Ethier was sitting in the same spot the night before!! I added some tied ribbons and buttons to the side. Because there is always room for buttons!! I always feel like spring is coming when my husband and son start getting excited for baseball season. They've been watching preview shows on all the teams, my hubby is gearing up for his fantasy baseball draft...when the season starts, he basically eats, sleeps, and breathes baseball! Have a great Thursday, everyone!! Here he is channeling early years Jacques Cousteau when we were in Hawaii this past year. He's blind without his glasses so I was glad he made it back to the boat after our snorkle trip. Twice. And here's another one...we like to tease him about his pink phone. I am wearing his sunglasses which I think are very Kayne West gangsta. I know, I, know...don't ask what I was doing. It's a long story. And when he's around, I ALWAYS find strange photos on my camera when I download them. Like these!!! He's very creative, musically talented, and bakes a mean fruit pie and rocks the homeade donuts. He plays pictionary with my kids, is a free-spirit and is single-handedly bringing back the skinny jeans look. We love you, Uncle Paul!!! Here is a layout I did on myscrap retreat of Paul and my daughter. They love hanging out together and just talking, talking, talking!!! I made this using goodies from the March Crazy Daisy Kit. Check out that bling!!! YUMMO!! So...Paul...have a fantastic birthday today!!! And thanks for stopping by today...maybe a comment for me...huh Paul? Huh??? Do I have to beg????? I am back from my scrapping weekend and it's tough getting back to reality! With the time change and the looong weekend, today was a rough day. Nobody said being a rock star was easy, ha ha ha!! I hope you all had a great weekend. I am SO behind on visiting blogs. I am hoping to catch up this week. I feel like i've been gone for longer than a weekend. Here is one layout that I completed this weekend. I had the chance to play with some new Crate Paper. I bought some Pink Plum papers from Croppin' Paradise. And the colors are simply fabulous. So so so pretty, I really really love these papers. They are so much better in real life!!! I cut that big flower from one of the papers and added some paint, Thickers and ribbon. Pretty simple but the colors just pop. I am seriously in love with this paper. Did I say how much I love this paper??? Hee hee!! My pages leaned toward the simple the weekend, Ithink was too easily distracted. Hope you had a great weekend!! Thanks for stopping by, friends! Welcome to another Sweet Melissa Sunday. I did not bake this week due to the fact that I have been on a girls scrapbooking weekend since Thursday and just didn't have the time. Plus, the recipe was carrot cake and i'm not a big fan of carrot cake. No offense to all those carrot cake lovers, it's just not for me! But, instead I have a very easy cookie recipe for you. The other week I asked my son...If you could pick anything for me to bake, what would it be?? He looked at me a little funny and said...anything??? Like anything in the world?? So I told him to narrow it down to treats and he got this HUGE grin on his face, raced over to my cookbooks and took out my The Great Big Cookie Book cookbook. He poured over this book for about an hour until deciding on Crunchy Jumbles. I had never baked them or heard of them! But after looking at the recipe, I realized they are just chocolate chip cookies with rice krispies. So...I baked them for him! I had all the ingredients, even the rice krispies. 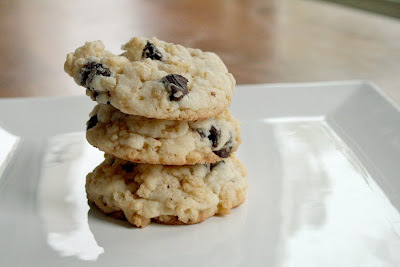 The recipe is basically a regular chocolate chip cookies with less flour and 1 cup of rice krispies. They turned out pretty good, nice a crunchy and chocolatey. Everybody in the family liked them, my son especially since I made them at his request. I think he thought they were a bit better just for that reason. And I found he bookmarked about 5 other cookie recipes for me to make in the future. I like how he's thinking ahead! Thanks for stopping by! Have a Sweet Sunday!! My first Crazy Daisy kit! Happy Friday everyone!!! 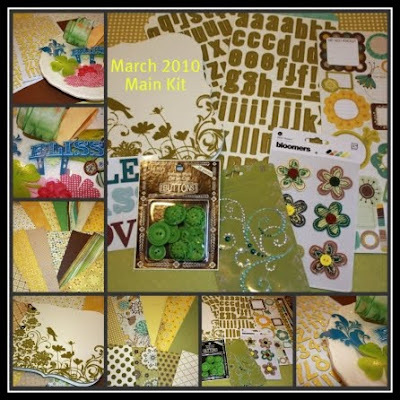 I am scrapping away with my girlfriends this weekend but wanted to show you some of my projects that I created using my very first Crazy Daisy kit. Look at all this goodness!! This is my son, playing his first game last baseball season. I played with the photo in photoshop a little bit. I changed it to black and white and then color spotted his number, name, and belt. Everything in his uniform that was yellow. I like how it turned out!! I finally jumped on the banner bandwagon. I cut those triangles for the banner on my Cricut, then threaded through some ribbon. Easy peasy! I think they add a fun touch to a layout, and I plan on making more banners. Hope you had a great week. Do you have something fun planned for the weekend?? I'll just keep scrapping my heart out...thanks for stopping by!! Hi Everyone!!! I have my Just Us Girls challenge today and it was a sketch. I loved this because I had little crafting time this week but needed to make a card for a friend. This sketch was the perfect jumping off point. The stamps are Papertrey Ink, as is all the paper. I really like the Kraft color with red. I got so inspired, I decided to make a little gift set. Papertrey has these stamps that coordinate perfectly with Hershey nugget candies. And their tins are perfect too! And I didn't stop there...here's a little notebook, too!! Funny how I didn't think I had time to craft, but I got so inspired that I couldn't stop until everything was made. This set is safely on it's way to a friend, hope she enjoys it!! I am leaving tomorrow for a scrappy weekend with my girlfriends, I cannot wait!! I still have lots of packing to do. That's the worst part...the packing. What to bring, what to bring!! Hee hee!! Thanks for stopping by!